AVR-X1300W is rated 4.2 out of 5 by 29. Experience state-of-the-art surround sound with the AVR-X1300W 7.2 channel Dolby Atmos AV receiver, which delivers breathtaking immersive surround sound with today's advanced movie soundtracks. Bring home the same revolutionary 3D surround sound used in premium movie theaters, with the ability to create an overhead soundfield to deliver a dramatically expanded sonic space. What's more, a future firmware update will enable the AVR-X1300W to decode DTS:X soundtracks, for full compatibility with all current 3D sound formats. The AVR-X1300W is futureproof, too, thanks to an advanced video section fully compatible with the latest HDMI 2.0a and HDCP 2.2 specifications on all six of its HDMI inputs. With 4K Ultra HD 60Hz video, 4:4:4 Pure Color sub-sampling, High Dynamic Range (HDR) and 21:9 video, 3D, and BT.2020 pass-through support on every input, the AVR-X1300W is ready for the next generation of Blu-ray disc players, set-top boxes and other 4K Ultra HD sources. And it has the sonic firepower to deliver cinema-sized thrills: the powerful amplifier section features discrete high current output devices on all seven channels, each of which is configured identically and rated at 80 watts per channel (8 ohms, 0.08%THD, 20Hz~20kHz). That generous current also means the AVR-X1300W has the ability to drive even lower impedance 4ohm speakers on all channels. Meanwhile the AVR-X1300W's built-in multiroom capability you can enjoy two different sources in different rooms at the same time, so you could watch a movie in superb surround sound in one room while another member of the family enjoys great-sounding music in another part of the house. Full wireless connectivity is provided by both Wi-Fi and Bluetooth, with dual antennas to ensure robust signal transmission and reception, and you can stream your favorite music through AirPlay, or from Spotify Connect or local network storage drives. High-resolution audio playback, all the way up to 192kHz/24bit and DSD5.6, delivers incredible fidelity. Using the AVR-X1300W is simple, too: the brand-new "Denon 2016 AVR Remote" app is available from the Apple app store, Google Play, and the Amazon app store, allowing you to control the receiver from your smartphone or tablet. Dolby's revolutionary Dolby Atmos technology dispenses with the channel-based surround sound coding used for decades, in favor of advanced object-based coding, giving the sound designer the ability to place sounds precisely anywhere in the three-dimensional soundspace. Now you can enjoy this award-winning technology at home with the AVR-X1300W, which features the ability to connect a 5.1 surround sound speaker system and 2 additional overhead speakers or 2 additional Dolby Atmos elevation speakers for the ultimate home theater experience. The AVR-X1300W also features Dolby TrueHD and DTS-HD Master Audio decoding and other Dolby Digital and DTS audio decoding and processing. This includes both Dolby Surround and Neural:X up-mixing: users with a '3D' sound speaker set-up are able to get an enhanced surround experience from conventional Dolby or DTS–encoded content, or even music in stereo, using the full set of speakers installed in the listening room. Discover the incredible fidelity of high resolution audio tracks with the AVR-X1300W's ability to decode up to 24-bit/192-kHz lossless files (AIFF, FLAC and WAV; ALAC/Apple Lossless to 24-bit/96kHz), as well as DSD 2.8MHz (the audiophile format of SACD) and now 5.6MHz track. Play them from memory devices via the front panel USB, or from network sources – the AVR-X1300W will also play lossy file types such as MP3. The AVR-X1300W's six HDMI inputs, including one conveniently located on the front panel, all confiorm to the latest HDMI specifications, including 4K Ultra HD 60Hz video, 4:4:4 Pure Color sub-sampling, High Dynamic Range (HDR) and 21:9 video, 3D, and BT.2020 pass-through support. The advanced video section also features HDCP 2.2 compatibility, a requirement for 4K Ultra HD copy-protected content, ensuring the AVR-X1300W is ready for the next generation of Blu-ray disc players, set-top boxes and other 4K Ultra HD sources. Featuring Bluetooth & Wi-Fi wireless streaming connectivity, the AVR-X1300W is equipped with an advanced dual antenna system for robust and error-free streaming even in congested urban environments. Connected to the Internet through your home Wi-Fi network (or with a hard-wired connection via the RJ-45 Ethernet LAN port), it allows you to enjoy your favorite tracks from streaming music services such as Pandora, Spotify Connect and Sirius XM (depending on local availability). You can also choose from thousands of Internet radio stations from around the world, and enjoy music and speech entertainment of virtually every genre. The all-new Denon 2016 AVR Remote App lets you control the AVR-X1300W with your smartphone or tablet: it's available for both Apple iOS and Android devices. With the free "Denon 2016 AVR Remote" for iOS and Android, available from the Apple app store, Google Play or the Amazon appstore, you can control the receiver's operation, as well as accessing its set-up menu, from a smartphone or tablet. The app also gives you quick access to the receiver's status display, option menus, Denon Blu-ray player control, and an online owner's manual for your convenience, while the new queue management feature means you can browse and add new tracks to the playlist on the fly. Featuring high current discrete power output devices on all seven channels, the AVR-X1300W is rated at 80 watts per channel (8 ohms, 20 Hz~20 kHz, 0.08% THD). It's also equipped with high-current low impedance drive capability, for compatibility with the widest range of loudspeaker models (down to 4 ohms). A single subwoofer can give an uneven bass response at the main listening position, with audible peaks and dips. The AVR-X1300W provides for two subwoofers: positioned in different locations, they will even out the low frequencies, for more accurate bass anywhere in the listening area. 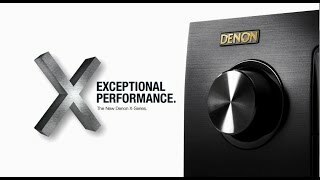 As the first AV receiver manufacturer to embrace Audyssey's advanced DSP audio algorithms, Denon brings to the AVR-X1300W the Audyssey Silver suite of DSP functions, which includes MultEQ XT, Dynamic EQ and Dynamic Volume. Audyssey MultEQ XT automatic room acoustic measurement and correction system uses athe supplied microphone and a test-tone sequence to match your speakers to your room's acoustics, giving the smoothest, most natural tonal balance. The MultEQ XT system here provides greater filter precision for the main and satellite speakers, with eight times the resolution of the base MultEQ system, at for up to 8 measurement locations to ensure the best sound for the whole family, not just one ideal 'sweet spot'. With the AVR-X1300W it's possible to enjoy 5.1-channel surround in one room, while another 'zone' plays another source–such as CD or streaming audio. You can simply connect a pair of stereo speakers to the multi-room amplified outputs. Or, connect a separate stereo amp and speakers to the Zone 2 pre-outs, allowing full 7 channel surround sound in the main room with stereo in the second. The high quality multiway speaker terminals handle a number of cable terminations including banana plugs, and are also color-coded for correct first-time hook-up; color-coded speaker cable labels are provided. The AVR-X1300W's clear, easy to understand graphical on-screen display guides you through the set-up process to ensures the correct configuration. The exclusive Setup Assistant and the included Quick Start guide together provide easy setup guidance, leading the user step by step to optimize critical settings for the best possible sound and video quality with your system. The AVR-X1300W is part of Denon's range of IN•Command series of custom integration friendly AV components, equipped with a range of features to provide enhanced control capabilities and compatibility with 3rd party and custom integration solutions. The AVR-X1300W can be set up and operated by a home computer on the network via IP control, either via wired LAN connection or Wi-Fi, and also features Control4 SDDP (Simple Device Detection Protocol) certification for quick and easy integration with Control4 home automation equipment. For simpler integrated control set-ups, the AVR-X1300W features an IR (infrared) remote control input on the rear panel, allowing remote control compatibility with other components in your home theater system. Rated 5 out of 5 by Wood Artist from Massive improvement I have been using a Onkyo amp for the past 9 years and enjoyed its sound quality very much....Until I bought this Denon last week on a whim while in Best Buy. All I can say is WOW...I am impressed and glad I did. It rreally brings out so much more in my Klipsch subwoofer and Boston Acoustics speakers. Excellent choice and a big thanks for the recommendation from the Best Buy rep. Rated 5 out of 5 by dmeza from Great sound The receiver is very good and for the price is a really good deal however with latest firmware there is an issue and after a few hours of usage the sound us muted from all speakers, not even a factory restore resolves the issue. I have found the solution to this problem which is upgrading the firmware again by using a USB device, it overwrites the settings and restore sound, very strange issue but Denon must solve it as it is clearly related with firmware. It just happened after upgrading the latest version of it so Denon please fix the problem on current FW level. Rated 5 out of 5 by ttjkstn from ok Väga hea ja kvaliteetne. Lihtne kasutada online raadioid. Rated 5 out of 5 by Jim G from Amazing receiver at a sweet price! Purchased this to update to 4K compatible receiver. I was pleasantly surprised that I could get a high quality Denon product with Dolby atmos for a reasonable price. The setup menus and included microphone made initial setup a breeze. The receiver breathed new life into my old 5.1 speakers. Next upgrade will be to get speakers for height channels to get the full Dolby Atmos experience. Rated 3 out of 5 by R Real from Good AVR receiver, but app is a no go This receiver does it job as soon as you do not engage too much with network features. The app is, as well as withthe older models app, a disaster. I have never managed to control this or my other older Denon receiver with the official apps in a stable way. Playing music from my NAS has never worked properly. So, I have to use the remote control as in the old times. With regard to the quality of sound you get what you expect from a Denon device, no disappointment in this respect. Rated 5 out of 5 by paul1235 from great for the price, basic features I don't need two HDMI outputs. It doesn't support odd screen sizes like 2.5K, only 4k and 2k sizes. This item is discounted because it isn't current model so it is a great buy. Get the warranty for peace of mind at BestBuy or Amazon, I got BestBuy warranty for five years. Firmware update brings HDR10 and Dolby Vision. Great sound with average speakers either 4 ohm or 8 ohm. 5.1.2 sound for Atmos. I use seven book shelf speakers and one subwoofer. I like the simulated surround from either 5.1, 2.1 modes into 5.1.2 sound.